Split-second decisions can sometimes change matches and seasons. On rare occasions they can change the way football careers pan out, too. Sadly, this was the lot of George Gibbs. Few players who represented the Magpies in the 1920s and 30s suffered as much bad luck when it mattered. He could quite easily have played in two Premiership sides. As it was, he was cruelly denied a spot in successive Grand Finals. 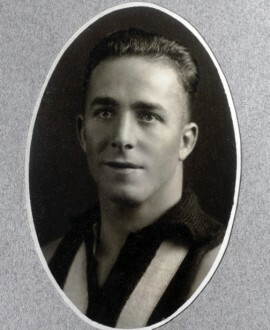 Gibbs was recruited from Fitzroy, where he had played 11 matches. Though born in Carlton, he was a Collingwood boy at heart. His parents owned a wood yard on the corner of Vere and Cromwell Streets. Gibbs also worked in the Collingwood boot factories in those years, in a trade that would later see him own a footwear manufacturing business. The 179cm, 79kg Gibbs won his way into the Collingwood team during the stellar 1929 season. He forced his way into what was a Premiership team for the first game, playing in the forward pocket alongside Gordon Coventry. But it was as a follower that Gibbs found his niche late in the season, playing his best football of the year. In the end he played 17 of the 20 games in 1929, and walked away with a hat from Treadways for the best first year player. The Sporting Globe described him as “a Fitzroy reject, but making good with the Magpies. A good exponent of boxing, he could use his hands to some order. His forte is his strength. He does not possess much marking ability, but he can kick the ball well.” A vigorous player who was renowned for his tough shepherding, Gibbs was “never conspicuous in the spectacular sense, but [was] very solid in his efforts”. Syd Coventry held no grudges. He organised a job with the Board of Works at Braeside for Gibbs, who lived in Edithvale. His football was looking up, too, in 1930. One observer said he “looked to have improved immensely and will have plenty of ruckwork to do”. Again, however, fate intervened. Gibbs suffered a broken wrist late in the season after a motorcycle accident while he was out working. He worked assiduously to get fit again and forced his way back into the team for the final against Geelong, a game Collingwood lost. When the Pies named their team for the Grand Final the following week, Gibbs was once again the man to miss out. It was cruel luck that those two incidents cost such a good clubman the chance to play in a Premiership. Even worse was the fact that the Geelong game turned out to be his last in the VFL. Gibbs was appointed playing coach at Yarram for 1931, then filled the same role with Sale. He also returned to boxing, even managing some bouts at the West Melbourne Stadium (which became Festival Hall) later in the 1930s. But nothing likely ever made up for his last-minute omission from two successive premierships: George Gibbs deserved better fortune than that.